As night falls on Busch Gardens Tampa, the theme park transforms into the Dark Side of the Gardens for the second year in a row at Howl-O-Scream 2012, this year thrilling audiences with new and retooled haunted houses, fresh street characters, and an assortment of enjoyable shows and other entertainment. While production values may not be as high as some other local theme park offerings, Howl-O-Scream makes up for it with high energy, excitement, and a clear passion for what is supposed to make Halloween fun. Last year Busch Gardens ditched the idea of a central icon to represent its event in favor of finding its own brand of Halloween. The Dark Side of the Gardens was born in which visitors knew that nowhere in the extremely large park was safe and that a variety of interesting characters could produce a scare at any time. 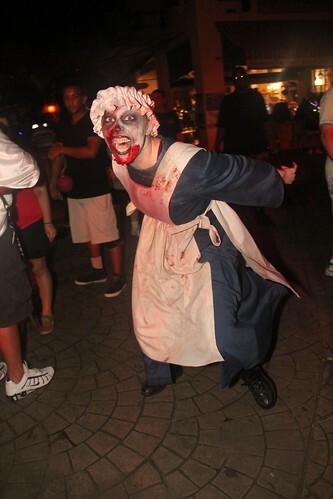 While the subtext of zombies accompanied the 2011 event, this 13th year of Howl-O-Scream even ditches that notion, instead returning guests to the Dark Side of the Gardens with few expectations other than to simply have a ghoulishly good time. In its thirteenth year, Howl-O-Scream continues to improve all its experiences, recognizing the need to retire older mazes and concepts, replacing them with some of the best in the event’s history. It has its low points, but the general opinion I left the event with last weekend was that of smiles, laughs, a few serious startles, and an overall enjoyment of everything that was there. Watch the video below for highlights of what guests will find throughout this year’s Howl-O-Scream, from the streets to the theaters and beyond. With a (mostly) young, eager cast of scare-actors and dancers, Busch Gardens keeps Howl-O-Scream feeling fresh year after year. The makeup, costumes, and character designs may not be Hollywood quality, but the enthusiasm for the craft makes up for it. Those looking for quick scares, lots of laughs, and plenty of often-risque entertainment will leave Howl-O-Scream feeling fulfilled, never once taking any part of it too seriously. 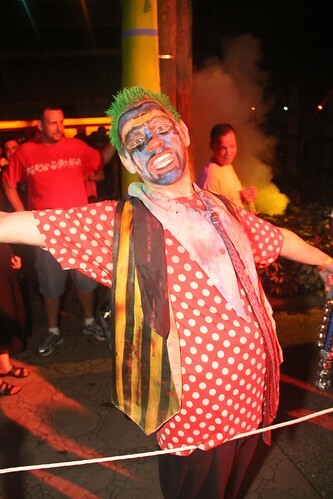 Halloween in Tampa is all about the simple thrills of what makes this spooky holiday the best of the year. 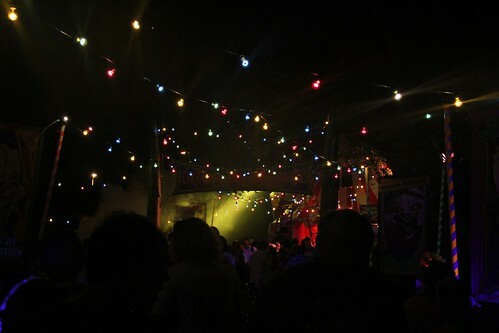 Though the haunted houses are fun, the streets of Howl-O-Scream are where the excitement lies, with no dark corner safe in the long, winding pathways of the park. Last year scare zones were removed completely, leaving roaming hoards to haunt seemingly at random. 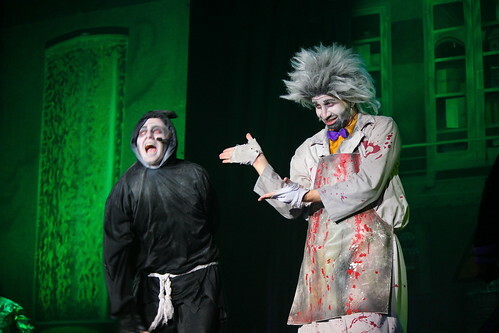 It was wildly successful for Busch Gardens, with screams emerging from all over, so Howl-O-Scream 2012 features the same concept, with new characters. The most interesting aspect of stumbling across the varied characters are the routines they perform. 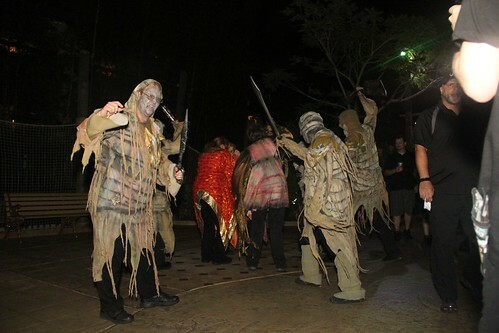 While these large groups of at least 10 similarly themed actors will wander individually, surprising and scaring anyone they come across, they will occasionally band together and perform some small act as a group, drawing a false sense of security from onlookers before they suddenly break free in an explosion of growls and screams. It’s an amusing moment every time. And most importantly, it’s obvious that each and every actor is having a blast doing it, which is contagious. From evil clowns to grave diggers with sparking shovels to playfully sinister young kids, the wide variety of characters keeps visitors on their toes. The huge cast of characters almost never leaves a dull area of the park, from the front gate tram stop all the way to the far backside. Howl-O-Scream repeats many of its mazes from year to year, making subtle changes to them that keep them interesting, but still retain the same basic experience, which is sometimes good, often repetitive. 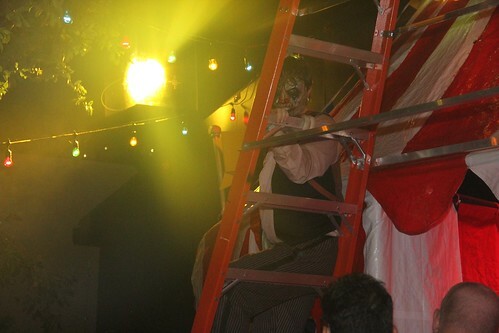 But new haunted houses are also introduced each year, with two all-new experiences being offered for 2012: Circus of Superstition 3-D and Blood Asylum. Check out glimpses inside both in the video below, followed by my ranking and full review of this year’s mazes. 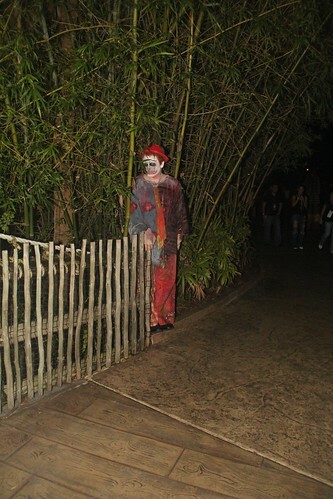 When I first heard Busch Gardens was going to devote a haunted house to the concept of the circus with evil clowns, I rolled my eyes thinking there couldn’t possibly be any new way of presenting this concept that would be original, unique, or interesting. But I was dead wrong. 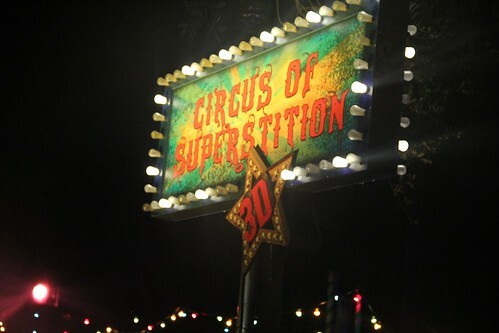 Circus of Superstition 3-D ended up as my favorite maze this year for a number of reasons. It all begins with the most elaborate of exterior setups that I can remember ever seeing at Howl-O-Scream. 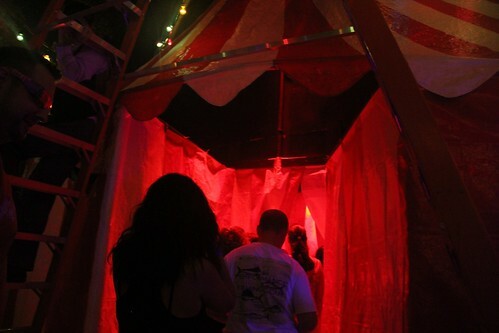 An inviting circus tent is preceded by flashing lights, a bright sign, gorgeous glowing artwork, and a few amusing characters inviting guests to enter. Inside, the 3-D effects work wonders, with vibrant black lights making fluorescent decorations and shapes pop out and “push” in to walls, floors, and, at times, invading personal space. 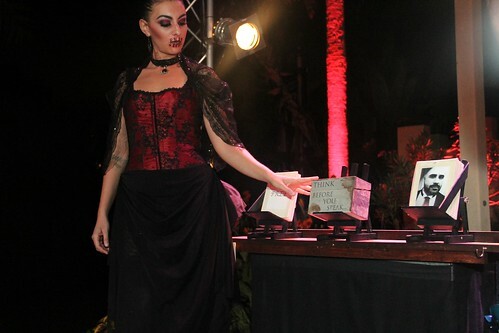 The theme carries guests through an interesting mix of superstitions, from bad luck caused by breaking mirrors to spilling salt, each presented in a unique and inventive way that entices guests to think for a moment, laugh, and then be startled by an unexpected scare. Actors not only pop out from dark corners but also lunge and leap, disappear and reappear under brief moments of pitch darkness, and blend in with colorful dummies. Every corner results in something unexpected, which was the most appealing part to me. I suspect repeat visits to this maze won’t be quite as exciting as the first, but it’ll still remain highly amusing. My only gripe about this house is that it didn’t really feature what was billed as the “icon” for this year’s event, Trickster. I think it was supposed to be him outside the maze entrance, but I could be mistaken. But the event really didn’t focus on or even need an icon to begin with. Last year both Busch Gardens and Universal Orlando introduced mazes based on the writings of Edgar Allan Poe. While the house at Universal’s Halloween Horror Nights 21 was far superior, in my opinion, and my favorite of the event last year, Busch Garden’s maze was less than exciting. 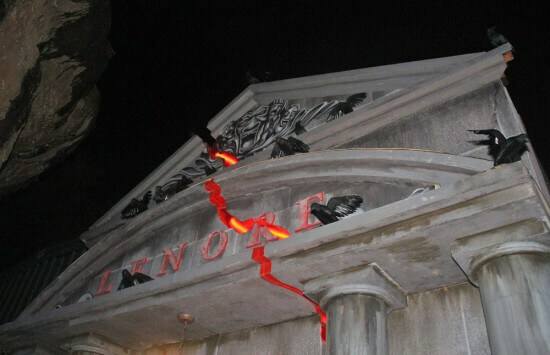 However, that has changed this year, with a noticeable improvement to the flow, pacing, visuals, feeling, ambiance, and style of the Nevermore maze, which has returned. Maybe it was a sense of nostalgia for me, as a big Edgar Allan Poe fan, excited to revisit last year’s maze that I so looked forward to, but I did find enough changes (some that seemed to be “borrowed” from Universal’s take on the theme) to make me more interested and excited about the Howl-O-Scream version. Of course, Universal doesn’t recycle their mazes, so this is the only version I’ll get. Potential bias aside, it is still a fun experience. 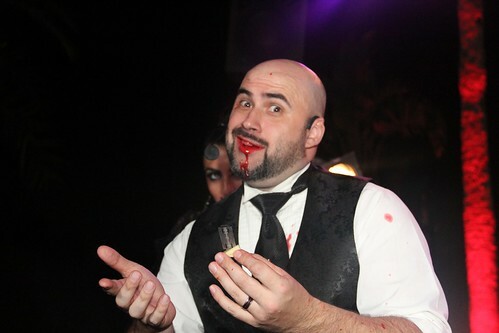 I was thrilled to enter the zombie-filled funeral home when Zombie Mortuary was introduced at Howl-O-Scream last year. This year, with few changes, it didn’t excite me quite as much, but it was still enjoyable and sure to scare timid event attendees and offers plenty of unique macabre moments, including ended up six feet under in your own grave, a scene that will stick in the heads of all first-timers through, as it did in mine last year. I’m glad Busch Gardens brought this one back, but I would like to see a twist on it next year if it returns again. The biggest disappointment of Howl-O-Scream 2012 is Blood Asylum, as the event’s new mazes are generally the best of the year. This time, however, this house already felt old and often comes off as repetitive. Using some familiar gags and sights from previous houses Reconstruction/Deconstruction and Death Row Vengeance, Blood Asylum is not all “new.” Moreover, having the same rather uninteresting character pop out repeatedly throughout the maze gets old quite quickly, as you can see from my reactions (or lack thereof) in the “scream cam” video below. Blood Asylum isn’t a bad maze, but it’s not a good one either. It’s only in its infancy and I’m already looking forward to its replacement. I enjoyed the Vampire Casino when it was introduced last year and was disappointed to see it already made over into an entirely new experience this year, especially because the newness relies on a gimmick. Guests are pulsed in small groups through this maze, which is an excellent move by Busch Gardens to add more scares for each person. Moreover, one leader of each group is given a flashlight to illuminate the dark twists and turns inside. But I found the maze to be bright enough to see just fine without the use of the flashlight, as I tried to linger as far back and away from the group as possible. I’ll admit that this house did give me one solid startle from a well-timed actor above my head, so I have to give it credit for managing to scare me a little. But other than that, the highly-decorated casino visuals were all covered in dirty tarps and/or dusty darkness to the point where it no longer felt like the same house, in a bad way. I love the flashlight idea, but not the execution of it. 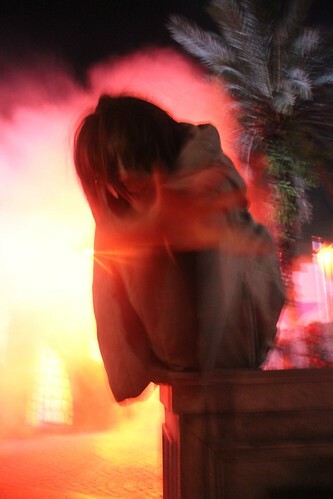 What once was my favorite house at Howl-O-Scream has now become thoroughly tired. I’ve been through Nightshade Toy Factory more times than I can count and after several years, it is simply ready for retirement. First timers will still likely find the visuals of insane toys to be entertaining and at times downright creepy, but for me, as an event regular, it’s really time to move on to something new next year. 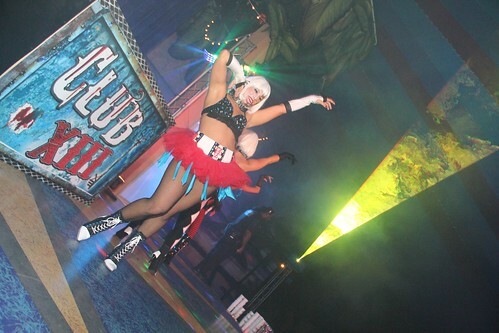 Busch Gardens’ famous “naughty nurse” show returns once again this year, as fans would never let this show leave. But that doesn’t mean it can’t change and this time Fiends has moved indoors, in the air-conditioned Desert Grill restaurant stage. For some it may be an unwelcome change, reducing the size and detail of the massive set that formerly took up the Stanleyville Theater. But for me, it was most welcome, offering an up-close view of the always-entertaining act with more comfortable seating available. It’s not an ideal location for watching any show, but getting there about 30 minutes before the show begins will land anyone a “front row” seat to watch Frankenstein’s monster, Igor, the Wolfman, and plenty of nurses boogie down just feet away. Same show, different routine. 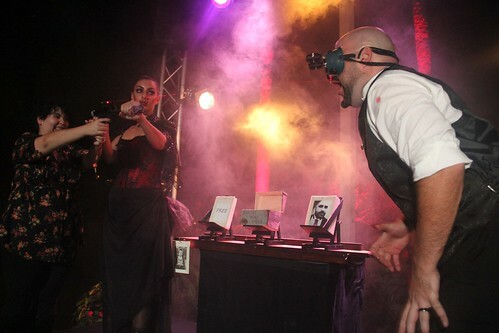 Magic acts are becoming pretty standard for Halloween events, often trite and dull, performing the same old tricks as every other act around. Somehow Slip of the Tongue avoids the dull part, staying highly entertaining, funny, and attention grabbing despite the fact that they are indeed performing many of the same old tricks. The duo has a bit of a Penn & Teller vibe, one vocal, smiling, funny, and engaging, while the other is entirely mute, relying on her excellent facial expressions and actions to keep the audience’s attention. 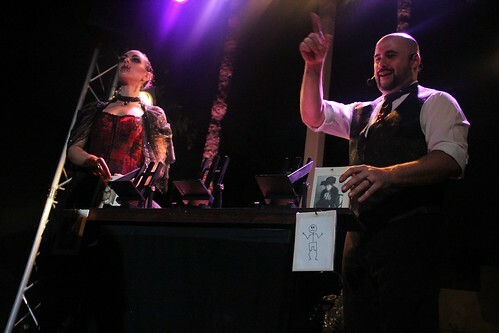 A spin on the magician-and-his-assistant routine, it’s clear that the mysterious woman with her lips sewn shut is truly running the show in this act, ordering the magician around throughout, intimidating him all the while. It’s a fun dynamic that when combined with a few cringe-worthy, shocking moments and a little (fake) blood comes off as an all-around enjoyable piece of entertainment – especially when it ends with someone getting shot in the face. What’s more Halloween than that? 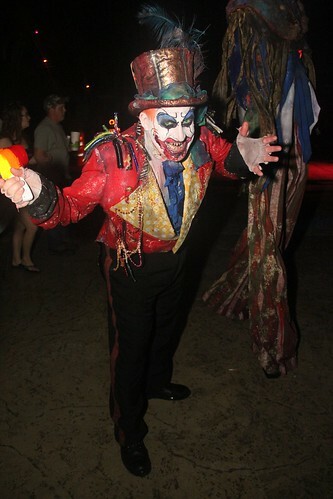 When Busch Gardens first added a nightclub scene to Howl-O-Scream a few years ago, they definitely hit on a much-needed outlet for those who want to escape the scares and drink, party, socialize and dance the night away. Club XIII is this year’s version, quite similar to all those of the past. Pretty girls in Halloween-esque tight clothing happily dance on stage and on the floor while drinks are served and a DJ spins high energy beats. It’s for ages 21 and up only, so it’s a place for adults to relax and have some fun on their own. And even for those not actively engaging in those activities, it still can be an enjoyable spot to just hang around. Get a Front Line Fear pass. It adds more to the cost of a ticket but to have any hope of seeing all the mazes and shows, it’s absolutely necessary. Lines are extremely long for all the haunted houses and I barely had enough time to see everything even using this type of pass. Keep your hands to yourself. 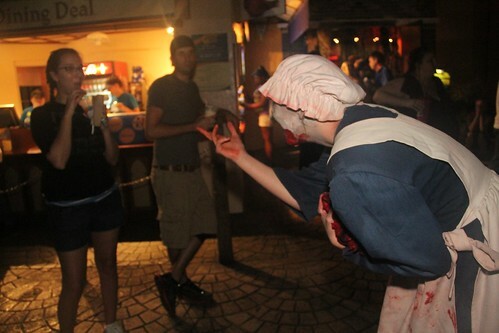 The young crowds of Howl-O-Scream can get unruly at times, which actors don’t appreciate. I watched a couple touch anything and everything while walking through one maze, including a few lifelike dummies. I’m just glad those did end up being dummies and not a real person or it would have been rather unpleasant for all three involved. Likewise, while taking a picture with a dancer in Club XIII, I discovered the “wound” on her back was fresh, leaving a glob of fake blood on my hand afterward. Beware. Arrive early and be ready for exercise. Busch Gardens is huge and with or without a Front Line Fear pass, everyone will walk great distances to get from maze to maze. I only completed a single lap around the park and it took up the entire night. 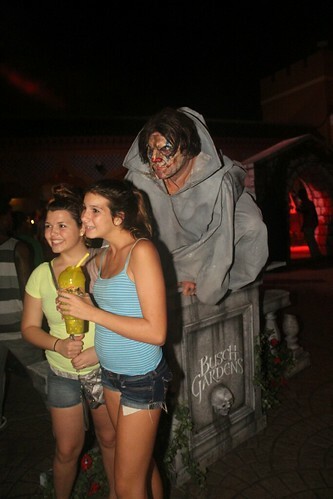 Howl-O-Scream at Busch Gardens Tampa Bay continues through September and October on select nights. Visit Howl-O-Scream.com/Tampa for more information and to buy tickets. Awesome! So glad that you enjoyed our scares and scream! One question: was vampire casino ” calling your name” ? Hah! Yes, it was most definitely. Thanks for that added fun. 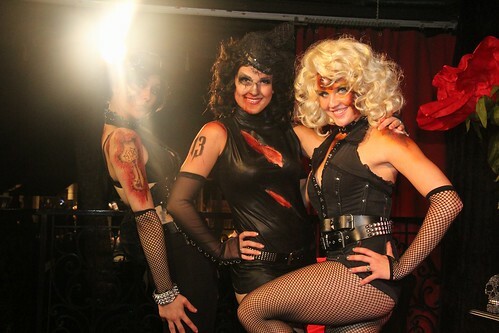 Here is an additional tip: Don’t bother seeing the “Fiends” (Nurse show). It was terrible!!!!!!!!!!!! They ruined one of the best shows ever to come out of HOS. Don’t waste your time with is crappy show. Obviously from my review above, I disagree. I thought Fiends was more enjoyable in the comfort of the Desert Grill theater. The outdoor metal bench seating in Stanleyville was always a miserable experience. I agree with Ricky. The show was great. I watched last years show and compared to this years, last years totally sucked! Igor and the Doc were a hell lot better also. 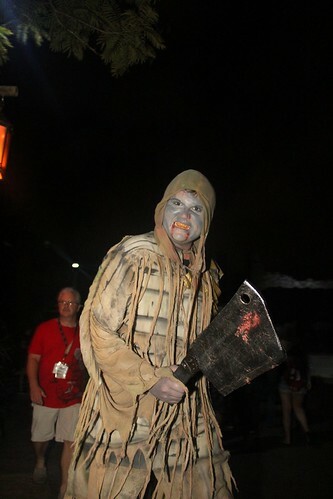 After coming back from the howl o scream last night, I was underwhelmed. 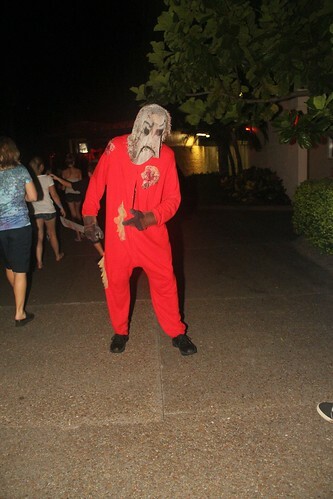 Honestly, the haunted houses were very poorly put together and very cheaply done in my opinion. It was extremely disappointing! The staff (blue shirts) did know the layout of the haunted houses and signage was not done well. We spent a lot of time trying to find the houses. Save your money and go to universal’s event. I was disappointed and felt like my money was truly wasted. I am regular at HOS and consider myself something of a connesuer. By comparison, this event was better than last years. Last year was better than the year before’s by leaps and bounds. I was skeptical of the recycled (dark side of the garden) theme, at first. After realizing that for the most part, all of the houses had some sort of change, I was relieved. 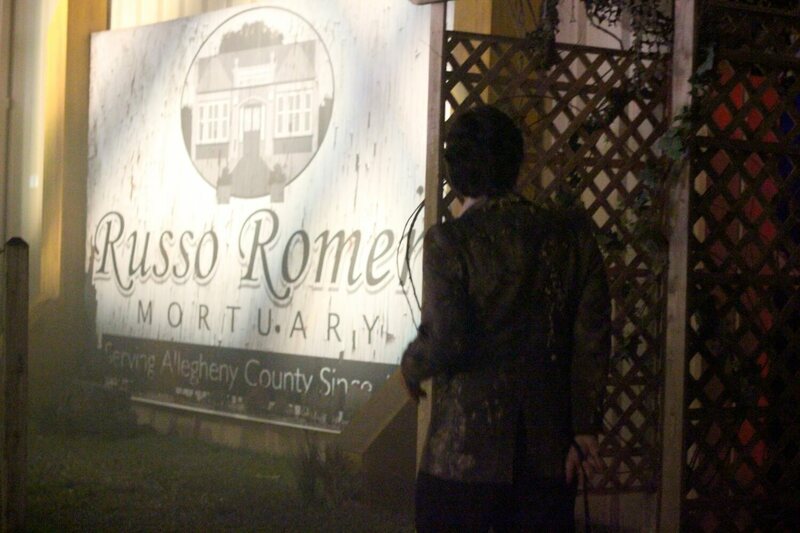 Zombie mortuary was the same as every year it’s been open. It should stay that way. It is truely perfect and Im glad it was the only house they didnt change. Nevermore was a lttle longer this year and has some additions, overall i liked it. They new circus of superstition was neat. The 3d thing was a really cool idea but really just makes some streaks on the walll stand out.Overall a pretty cool idea. Nightshade toys had some toxic mutation theme. It reminds me of the headlines of toxic toys imported from china. Nightshade toys is not an awful house, but i feel it’s time to retire it. Everytime i walk through that tunnel of raty teddy bears i cringe at the though of how much lice and bed bugs must be in there. The oglethorpe asylum( blood asylum) was ok. The most impressive part of the house was the way they transformed the horse stables into the corridor of some spooky looney bin. There were flickering lights, thunder sound effects, and even faux windows lighting up to suggest lightning. It’s fascinating how they turned a clear autum night into a stormy ominous one. Last , but certainly not least, was my favorite house of the night. They took last years vampire casino themed house and made it really awesome. Last year i wasnt too crazy about this one, but this year was a much different story. The layout and props are the same, the only difference is that the vampires have been over run by zombies!!!. This house is so dark, they give you a flashlight to guide yourself through. I love that. It makes the house more interactive. This was a truley creative way to recycle an expensive house. They didnt rely on any expensive effects. It was purely imagination which made this house so awesome. Zombie mortuary will always be my favorite, but this was a very close second. All in all a great year for Busch Gardens!!!!!! Reading all the reviews from previous HOS, and geez. Way to wright a novel, sport. But yeah. I agree. Pretty gucci in my coochi. I enjoyed it. This is the fourth year in a row that I’ve gone to Howl-O-Scream, and I’m sorry to say that I think it’s in a bit of a decline. If not for the fantastic ‘Alone’ which I’d never done before, I would have ended the evening feeling a tad disappointed. For one thing there was no theme to speak of this year, or rather it was the same vague and ill-defined theme as last year. Secondly, to my eye the scare zones seemed kind of sparse and light compared to previous years. Additionally, they cut back from two shows to one (Fiends only). Finally, I thought the Vampire and Poe houses were less elaborate and not as good as last year. To be fair though, I loved the 3D house, Nightshade Toys was bigger and better than ever, and Blood Asylum was over the top. Also, doing express passes like Universal HHN was a step in the right direction, though ironically it left us with a bit too much time and not enough going on to keep us interested (I don’t do coasters). Anyway, don’t get me wrong, overall I would still mostly recommend HOS, especially the Alone experience, but again, the whole thing just seemed a moderate step down from the past few years. How I miss the House of Vayne. keep visiting this website and be updated with the most up-to-date news posted here.